Remembering medical terms can be difficult. Few people are required to remember more than students and professionals in the medical specialties. I should know. I spent three years as a dental student before I finally dropped out. I don't recommend that. Better to finish what you start. Because medical terminology can be so difficult to learn, mnemonic tricks and the memory systems are powerfully helpful tools for your study arsenal. The Keyword system is the most effective memory system for learning medical terms. I've provided examples below to show you how to use this method. Use this system is whenever you have a term for which there is no easy mnemonic trick (more on these below). Remember that when using any of the memory systems, you must make an effort to clearly visualize the images. Your mental images are the "cues" (or clues) that help your brain retrieve the information from your memory. These cues act much like the label on a file folder. The label reminds you what's in the folder. Example 1 - "ginglymoid". This word means "pertaining to or shaped like a hinged joint" such as the elbow or knee. If you could associate the phrase "hinged joint" with the term ginglymoid in your memory, you'd be able to recall the definition easily. The first step with the Keyword system is to break down the word phonetically into syllables. Ignore the spelling. Instead, listen for the sounds of the syllables. For jingly mud, a memorable image could be jingle bells stuck in mud. I am trying to pull them out, but the mud is thick. My elbows hurt trying to pull it out. Try to see this in your mind's eye in great detail. What color is the ribbon? What type of metal are the bells made of? Visualize the brown, thick mud and my sore elbows. It is important that the image be silly, gigantic, or impossible. The crazier the better. The mind forgets the ordinary. It's the unusual that gets remembered! 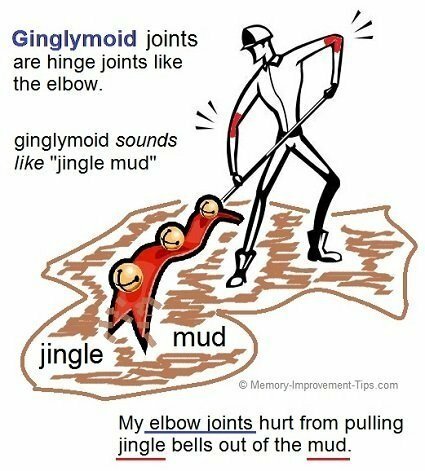 Now when I read or hear the word "ginglymoid", the sound of the syllables of that word will make me think of "jingly mud". If I have visualized and practiced this image, the sound recalls the crazy image of jingle bells stuck in the mud - and my sore elbows. Thus, I am reminded that ginglymoid means a hinged joint such as the elbow. How to easily remember the meaning of "-ptosis"
As you see in the video, he associated the sound of ptosis with "peanut butter toast". That's a concrete noun that's easily pictured in the mind and remembered. When you perform these steps in your mind, it goes very quickly. Like any skill, the more you practice, the faster you will become at this technique. Don't forget, you also need to periodically review your image to set it firmly in mind. Only a few seconds are needed to review an image. Making flash cards works wonderfully for this purpose. Review images after 10 minutes, then 30 minutes, then 2 hours, then less frequently (perhaps after one day, then one week). This will help set the image and associated medical definition in your long-term memory. Example 2 - "Minimata's Disease". This is a neurological disorder caused by accidental ingestion of mercury, which is a poison. To remember this fact and the name of the disease, visually associate the sound of Minimata (pronounced "mee-nee-mah-tah") with mercury. Remember that the visual images are cues, which means they need not include every part of the word or definition to remind you of the true meaning. If you study and understand a concept, then the visual cue acts as the filing cabinet label that allows you to access the location in your memory where that information is stored. "Minimata" sounds to me like "meany mat". I picture a mean bully door mat with arms, legs, and an angry face. This could be like the Welcome mat that many people have at their front door. Also, recall that your typical thermometer contains mercury (the silver liquid inside). I visualize the angry mat taking a huge thermometer out of his mouth (I guess he was sick, that's why he's mad) smashing the thermometer on the porch. This splashes the silver mercury all over and gets broken glass everywhere, which is hazardous. That image is not only silly and impossible, but it adds exaggeration (a "huge" thermometer) as well as action (smashing the thermometer). These extra dimensions make the image even more memorable. When I read or see the phrase "Minimata's Disease", I'll realize it sounds like "meany mat". This will remind me of the mean mat who smashed his thermometer and spilled mercury every where. Oh yeah! Minimata means mercury poisioning. MNEMONIC TRICKS. In addition to the memory systems, I recommend the medical mnemonics (memory tricks) relevant to your field. These provide ready-made memory cues for many terms. An excellent resource for medical mnemonics is MedicalMnemonics.com. It's a free site with thousands of mnemonics contributed by medical students from all over the world. You can even download their database to your PDA or smart phone and take it with you! MEDICAL DICTIONARIES. The best physical medical dictionary in my opinion is Taber's Cyclopedic Medical Dictionary . I have owned my copy since the early 1990's when I was in dental school. Taber's has been popular with medical professionals for years. It has more medical entries as well as higher user ratings on Amazon (for good reason) than other medical dictionaries. To quickly look up a term online, you might want to try one of the free medical terminology websites. MedicineNet.com, for example, has a free online search tool that last time I checked contains about 16,000 entries (in comparison, Taber's has about 56,000). 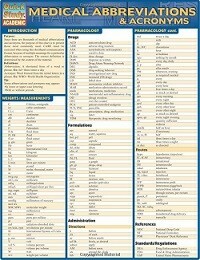 A medical abbreviations and acronyms chart is another helpful resource to have on hand when studying. Such charts can help you learn the most common ones and test yourself. The chart at right (available on Amazon.com ) is one such example and only costs a few dollars. LATIN & GREEK ROOTS. Finally, consider learning basic Latin and Greek word roots. Many medical terms contain Latin or Greek roots, prefixes, and suffixes. If you know these, you can often deduce the general meaning of a term. For instance, pachycelphalic is composed of the Greek prefix pachy-, meaning "thick", plus the root -cephalic, meaning "related to the head". So "pachycephalic" refers to someone with an abnormally thick skull. A helpul list of roots can be found on the Medical Roots, Suffixes, and Prefixes page on Wikipedia.com. There are more lists on the web that you can find by doing a Google search. Good luck with your medical studies. Don't forget to make your life easier by using mnemonics and memory systems!